from now on, the decision authorizing a sale will fall upon the Ministry of Culture, not the prefect ; this change, initiated by the Communist senators, was needed for the Minister of Culture to remain as part of the decision-making, when he was in fact ready to give up this role …We would like to commend at this time the admirable intervention of Jack Ralite who requested the pure and simple elimination of article 52. He found himself totally alone in the parliament when defending French national heritage, faced with a minister who seems to have abandoned all resistance in this domain. the monuments will have to be sold off as a whole, and not by parts as was planned initially, a process which would have led to their dismantling. Unfortunately, another amendment, presented by Jack Ralite again, was rejected. Both Frédéric Mitterand and the government were in fact against it . This amendment demanded that the municipality be forbidden from selling the monuments turned over to them to a private individual or entity. The government and the Senate accepted to make only one concession : the establishment of a period of twenty years during which the Ministry of Culture must be informed of the sale of a monument turned over to a municipality and which it may reject . Jack Ralite also pointed out that today mutualization enabled the survival of monuments with deficits thanks to those turning a profit. The logical consequence of this article to the law is the following : essentially, only profitable monuments, at least at first, will be transferred to local municipalities, leaving the government to bear the cost of the others. Only six monuments, of the 96 belonging to the Centre des Monuments Nationaux are in the black. They will be the first to leave the government domain. Two figures, available in the 2008 financial report of the CMN, illustrate the extent of the problem. 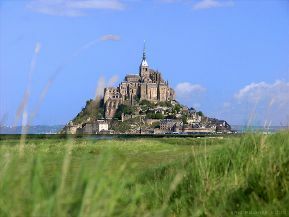 The Mont-Saint-Michel and Carcassonne (the ramparts and the castle), two sites owned by the government and managed by the CMN, bring in respectively 7 and 2.3 million euros. These will obviously be requested by the corresponding local municipality . The government will thus lose the revenue from these monuments. Faced with such a dilemma, it will have only three possible choices : increase the budget for the maintenance of the remaining monuments, let them fall apart, or draw up a new law allowing it to sell them directly to a private individual or entity. In its current form, the text virtually brings an end to the inalienability of assets belonging to the government’s public domain. It allows the transfer of any monument, and why not after all any museum as well since the question also concerns them , to a local municipality. They in turn will be able to sell them off claiming a financial deficit. Adopting such a text will be an extremely serious blow, yet another, to French national heritage. In fact, it is no coincidence that Jean-Jacques Aillagon speaks out firmly on his blog against adopting this article to the law which, according to him, goes much too far. And yet when he was Minister of Culture he had initiated this process himself (see article in French). We have here still another example of the legendary fable of Pandora’s box. The debates can be read in full here. A very fragile protective measure as most Culture ministers cannot stand up to their colleagues in the ministry of Finance and that after twenty years, they will no longer control anything. As written up today, the bill states that “public establishments” may transfer ownership of “real estate” and “objects”. Although many people, probably including parliament members, think that this refers only to monuments, museums are in fact included.